Previously I’ve spoken about switching over to organic dairy products, particularly milk, and why it’s important to me. When Clover reached out and asked me to partner with them on developing a Hanukkah recipe using their organic dairy line, I knew it was the perfect fit. 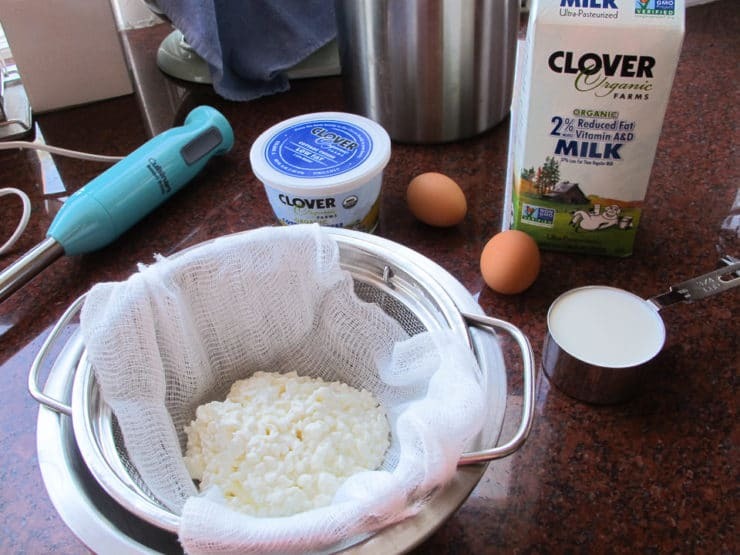 I love Clover and had already been using their organic dairy products at home, so creating a yummy recipe to share with all of you seemed only natural. The Petaluma Cooperative Creamery began distributing Clover Brand products throughout Petaluma, CA during the early 1900s. In 1975, a disastrous fire broke out in Petaluma, destroying the Co-op’s operating and bottling operations. Clover Stornetta Farms, Inc purchased the wholesale distribution business from the Co-op and started anew in 1977. In the years since, Clover has made more renovations to not only improve the quality of the processing facility, but to also make advancements toward doing things “greener.” During the 1990s, Clover furthered this endeavor by adding organic products to their impressive dairy line. Clover believes that being a sustainable business is the only way to do business, and I couldn’t agree more. Hanukkah is right around the corner, and you know what that means—tasty fried things! 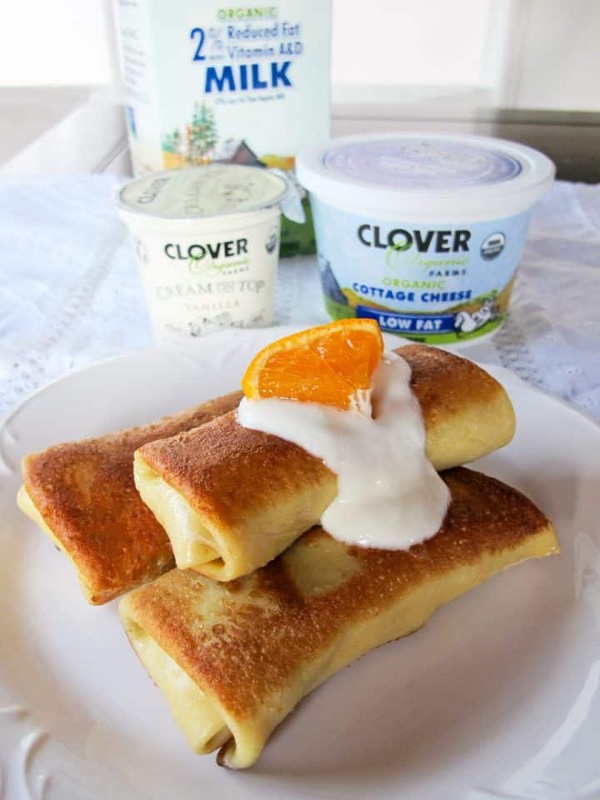 With a fridge full of Clover products, my mind naturally wandered to dairy blintzes. Blintzes are fried, which makes them a great choice for a Hanukkah breakfast treat. I gave them a wintery touch by adding fresh orange juice and zest. It’s easy to find a variety of big, beautiful citrus at the market this time of year. Feel free change it up with tangerines or cara cara oranges. The touch of citrus adds something really special to the blintzes and fills the kitchen with a warm, sweet scent that reminds me of the winter holiday season. Adding a dollop of Clover Cream on Top Vanilla Yogurt adds a touch of aromatic tang, making them extra indulgent. Enjoy! Clover Organic Farms is hosting a holiday giveaway of $100 in Clover Cash! To enter the contest, comment on this post and let me know what your favorite holiday recipe is. Include a link to a photo of your favorite holiday recipe with the hashtag #CloverCooks on any social media outlet for an additional entry! Please note: this giveaway is only open to people who live in California. Follow Clover on Facebook, Twitter and Instagram. Clover dairy products are primarily available on the West Coast. 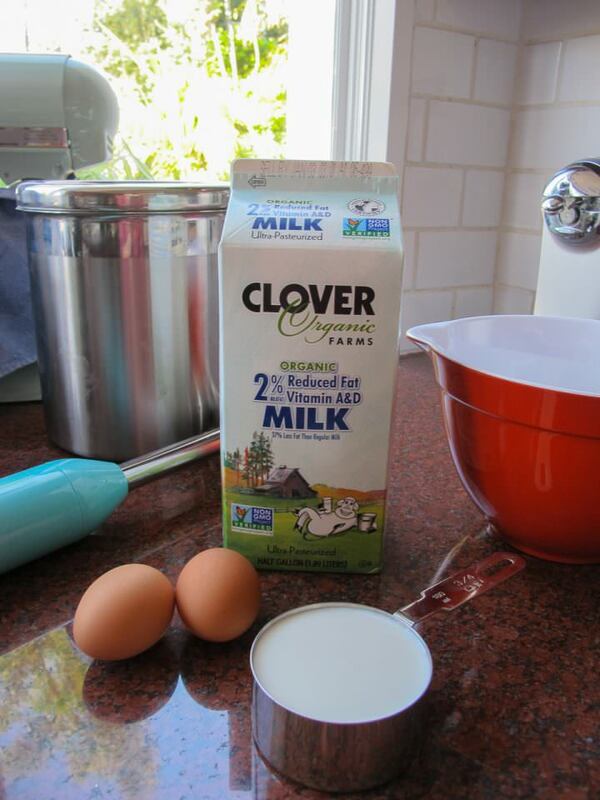 Click here to find out where you can purchase Clover dairy products. Sponsored by Clover Organic Farms. 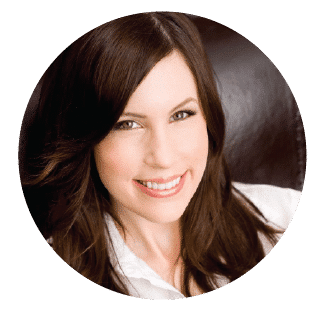 Thank you for supporting my sponsors, they allow me to share more free recipes, cooking tutorials, holiday crafts and food history with you! If starting the night before… place the Clover Low Fat Cottage Cheese from the filling ingredients into a strainer lined with cheesecloth placed on top of a bowl. Let the cottage cheese drain in the refrigerator overnight to remove excess liquid. If starting the same day… place the Clover Low Fat Cottage Cheese from the filling ingredients into a double-layer piece of cheesecloth. 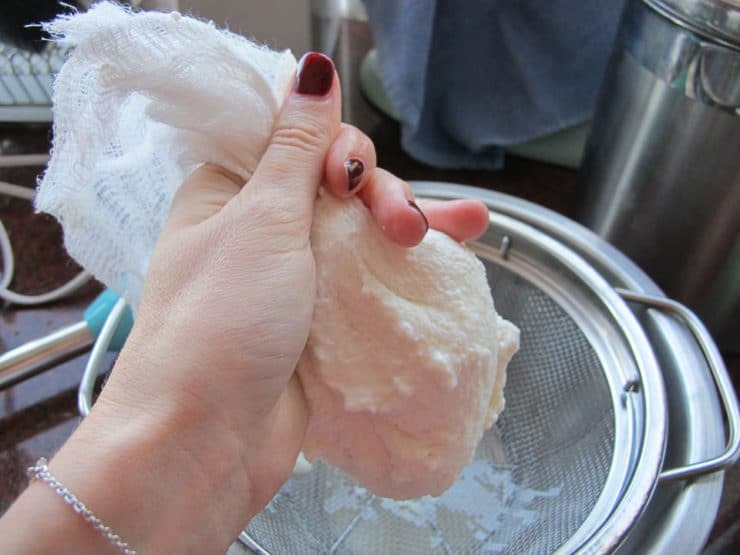 Gather the cheesecloth into a bundle around the cottage cheese and squeeze gently and repeatedly to remove as much liquid as possible. 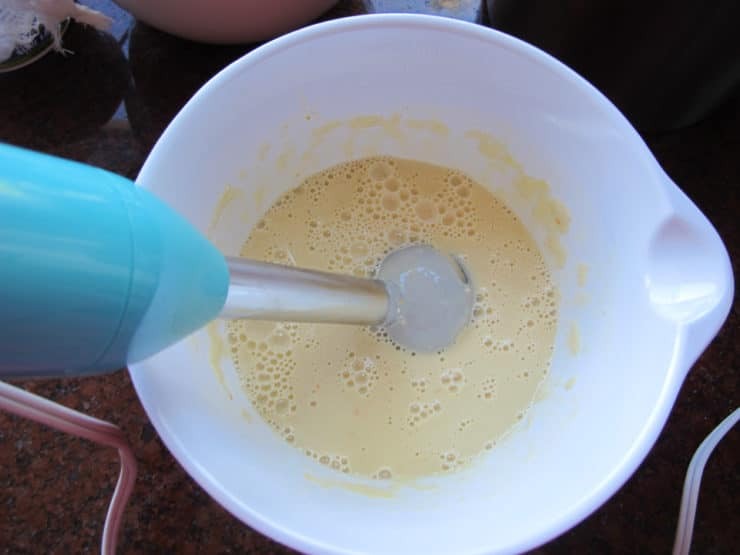 Blend all of the blintz batter ingredients together using a food processor, blender, immersion blender or electric hand mixer. 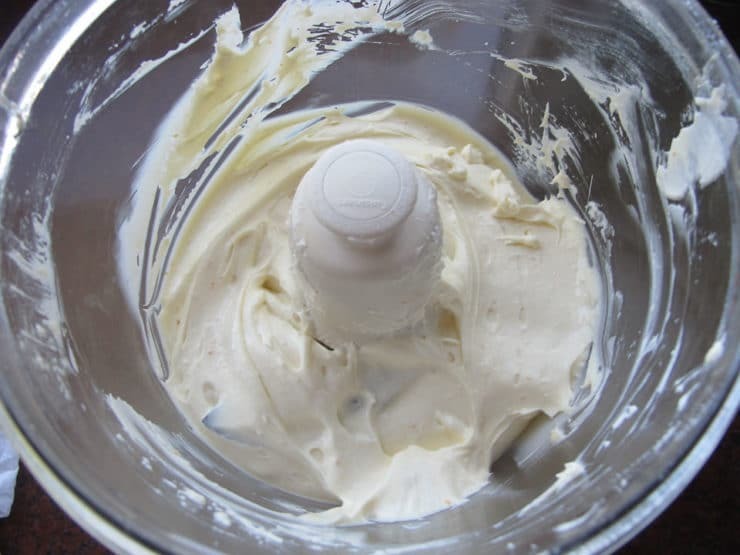 Consistency of the batter should be smooth (no lumps). Warm up a nonstick skillet on medium heat until hot. The skillet is ready when a drop of water sizzles on the surface of the pan. If the water pops or jumps out of the pan, the skillet is too hot—let it cool slightly before starting. If the water sizzles, it’s at the perfect temperature. Grease the entire surface of the hot pan generously with nonstick cooking oil spray (keep the oil spray away from gas stovetop flame). 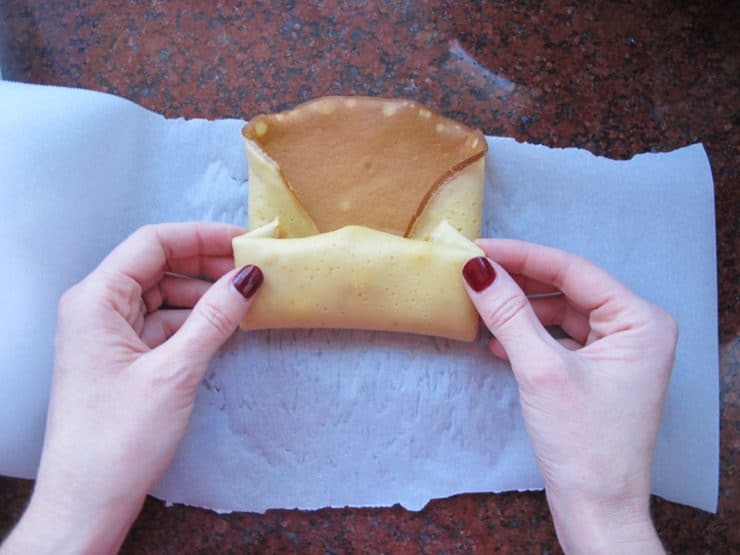 When all of the blintzes are cooked, create your filling. Put all of the filling ingredients into a food processor and blend until smooth. Alternatively, you can use a fork to mix all ingredients together. Now you’re going to stuff and wrap up your blintzes! 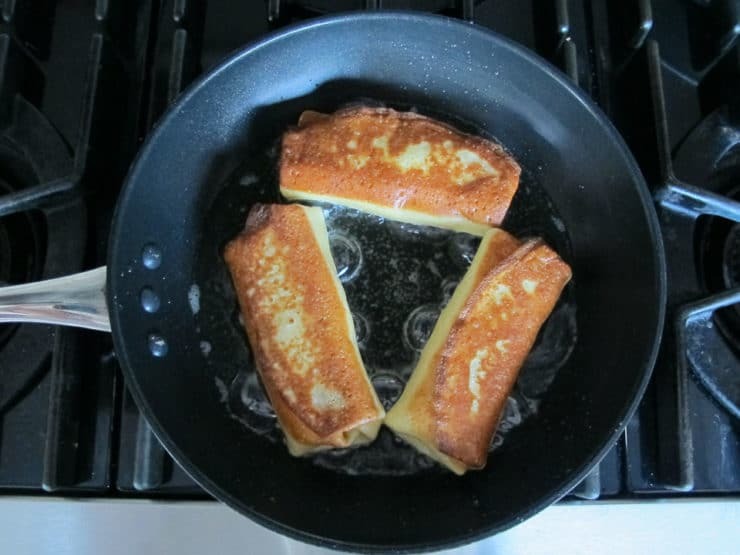 Place a blintz browned-side facing upward. 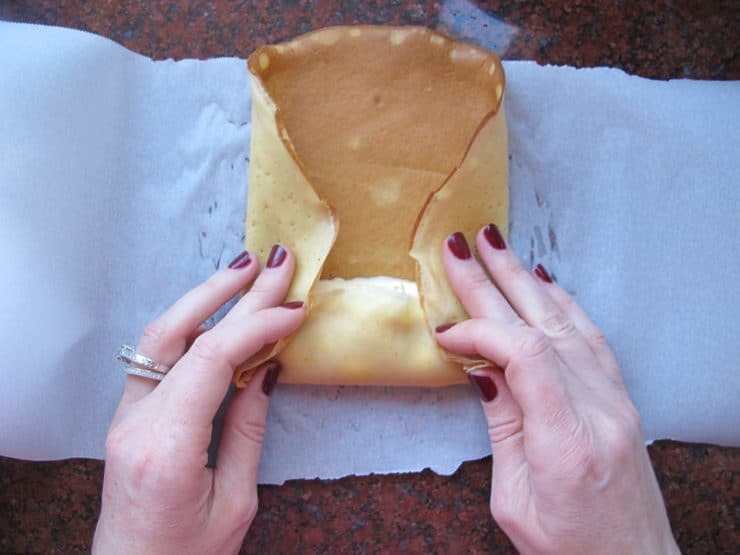 Put 3 tbsp of filling on the lower part of the browned blintz, about an inch from the edge. When the blintzes are stuffed and rolled, the less cooked side will be showing outside. Now you are ready to fry them. Pour 1/2 cup of frying oil into the skillet and heat over medium until hot. Do not let the oil turn brown or start smoking—if this happens, discard the oil and try again. Cook the blintzes in batches of 3--this will give you space to turn them easily in the pan. Carefully place the stuffed blintzes flap-side down into the hot oil. The blintzes should fry for 1 to 2 minutes until they’re brown and crispy. 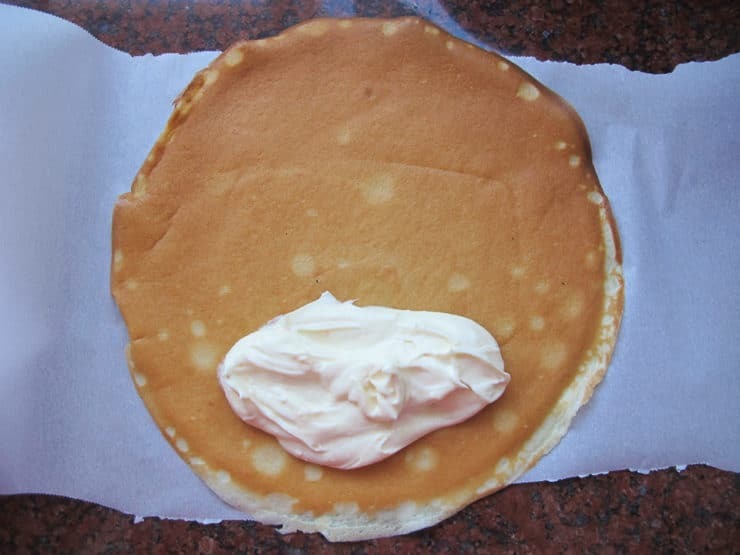 Turn the blintzes carefully using a spatula and/or tongs, then fry for an additional 1 - 2 minutes. 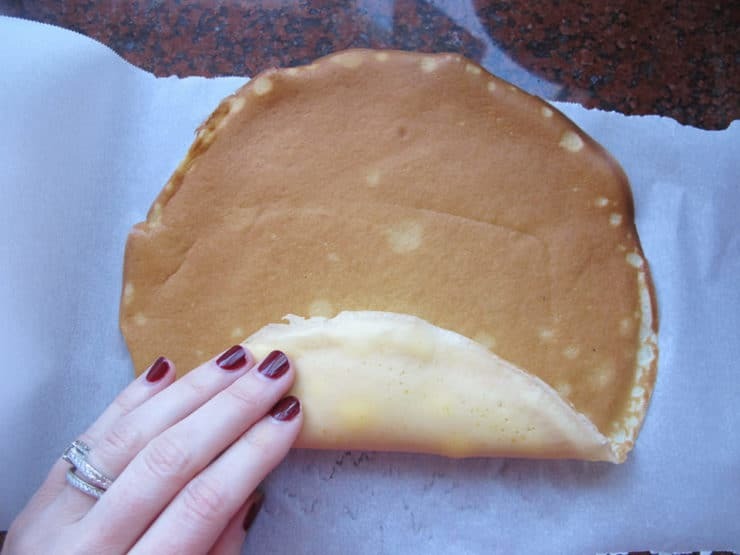 Blintzes should be evenly browned on both sides. Serve blintzes warm. They can be served as-is or made extra special by topping with a dollop of Clover Cream on Top Vanilla Yogurt. What is the purpose of the egg yolk and is it possible to leave it out? All of your recipes look absolutely fantastic I look forward to trying them, starting with this one. The egg yolks adds richness and thickness to the filling, but it’s not necessary. You can leave it out if you prefer. Wow! I love your traditional blintz recipe, this one takes it over the top. The orangey flavor is so nice, gives it a great twist. I used Clover products, we are in Northern CA and love their stuff. Thank you for sharing! when i was catering i had to make large quantities. i would sprinkle matzo meal on crepe to keep them separated. much easier than other type of separators.. hope this is helpful. millie langer the educated palate. great reminder, haven’t had one of these in a long time and have never made them so am glad to have this recipe, thank you for sharing it! WOW!! These sound yummy. An I was just wondering what to make for Hanukkah. Thanks for the idea. On the way to the store. These look and no doubt taste delicious. Also great timing, as here at least there are plenty of fresh local oranges at this time of year. I can’t get cottage cheese here though. Do you have any other suggestions? How about “queso fresco” as I understand this is similar to cottage cheese without the liquid! Ricotta will also work great, just make sure to drain it of extra liquid per instructions above. I haven’t tried making these gluten free, so unsure how they will work out. Why not use gluten free wraps that have been wrapped in orange zest? Then the next day, remove the zest and fill as per your recipe. I personally will be making mini blintze tomorrow, and can not wait. I substitute my own oat flour and stevia and am drooling. 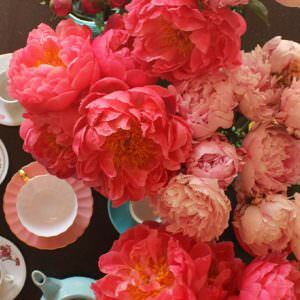 Sincere thanks for your creative and delicious recipes. I saw your waffle recipe in place of latke and have already shredded the potatoes and will cook them on light and tomorrow when i am half asleep will place on a pan and cook, I will spray them with pam, and the family will enjoy. Happy Chanukah, Merry Christmas, Happy Happy to all! Wow, those sure look good. 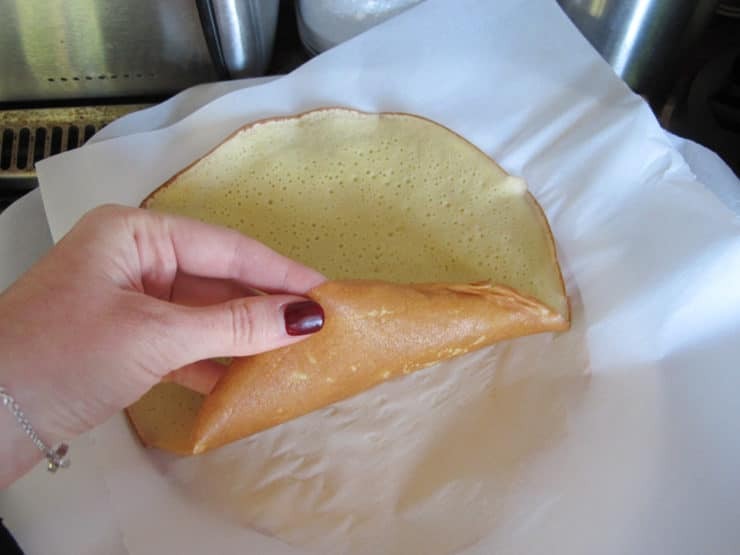 I’m curious, are the batters for blintzes and crepes very similar? I am inspired to make these before, during and after the holidays! Thanks for posting these and offering the step by step pics. I’m not Jewish but LOVE all Jewish food and I enjoy following your blog. 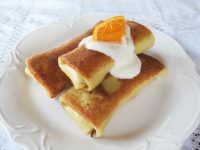 I love blintzes, and never even thought about making them. It doesn’t seem too difficult, so I just might give it a whirl. Hi, Tori is there a way to make this without frying? Hi Marcy, for the first step of cooking the blintzes you need to do them in a lightly oiled skillet (spray oil). For the second part, the “deep fry,” I think you could alternatively use a lightly oiled skillet coated with spray oil, but you would need to maneuver them a bit to ensure even browning/cooking on all sides, and I’m guessing they will take about twice as long to cook through. They won’t be as crisp on the outside, but they’ll still be yummy. 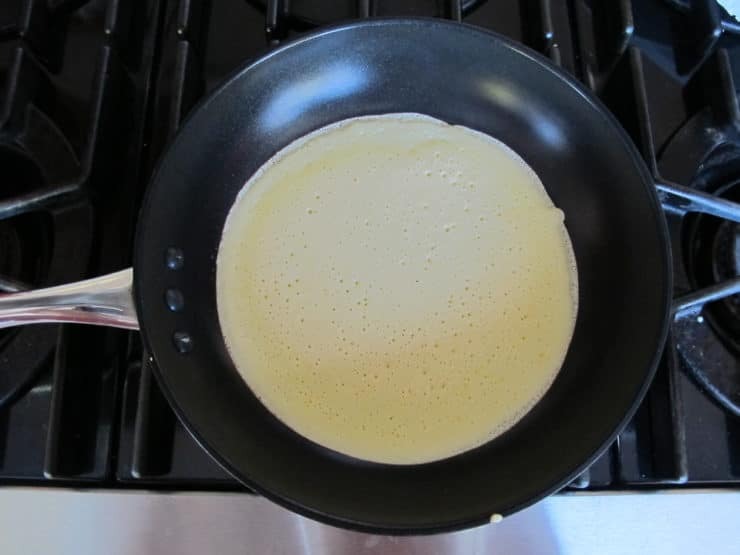 🙂 The other option might be to cook the blintzes on both sides before filling (flip in the pan to brown both sides), then fill the blintzes, then bake for a bit to cook through the filling. I haven’t tested that myself, though, so I don’t have an accurate timing or temp for you. Good luck! in stead of frying you can bake them, as you would any quantity. use buttered utensil, 350 oven, as instructed for frying. you can flip for a crisper version. My favorite holiday treat is latkes. I watched my Bubbie make them a hundred times, while my dad and uncle stood over her by the stove, supervising. LOL. I use her box grater and I feel so connected to her. 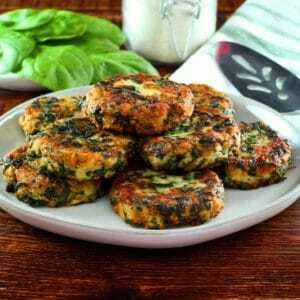 Clover dairy products would be perfect for my grandmother’s cottage cheese latkes. Oh how I miss them.